I made this quilt more than two years ago, as the wedding quilt for son and daughter-in-law of my Idaho bestie, Deb. 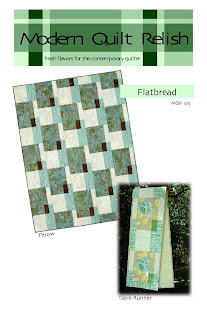 The pattern is "Flatbread" by Modern Quilt Relish. Because it's a decidedly "modern" quilt, I wanted to do straight-line quilting on it. But it's way too big to wrestle through my home machine, and I couldn't find a long-armer who was enthusiastic about straight-line quilting. So time went by, and I brought home my own long-arm machine, Meggie. 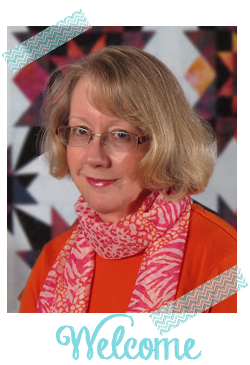 I put off quilting the quilt "until I got better at long-arming." Now Judd and Yvette have celeberated their second anniversary, and it't time to send them their quilt (especially since both his brothers already got a wedding quilt!) I dragged it out of the "to be quilted" pile and realized the fabric I had for the backing was too small. So off to Ruth's Stitchery to buy some 108" wide backing fabric. I prepared the backing, and realized my usual cotton batting is too narrow! (This would be my hint that this is a really big quilt, wouldn'tjathink?) Luckily, Connie Potter sold me a roll of 108" wide Hobbs 80/20 a couple of years ago. It's only at this point that I thought about how wide my machine table is vs. how long the quilt is. 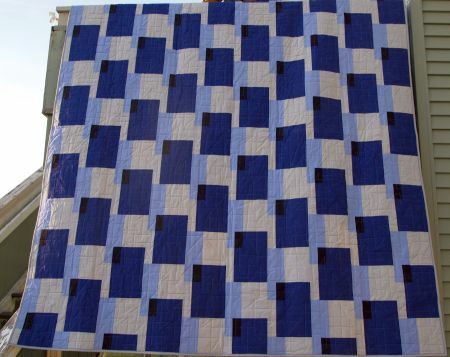 I wanted the quilting to run vertically on the quilt, so it would have to be loaded on the table horizontally. Or about 10" longer than my table is wide. So I loaded it vertically and quilted "triangle meandering" on it, and it turned out very nicely, thank you! I didn't think to take a close-up of the quilting, so you'll just have to take my word for it! It's already in the mail to the "newlyweds!" I hope Judd and Yvette forgive me for taking so long to get their quilt finished! I gave up struggling to quilt anything larger than single bed, all my quilts are sent off to be longarm quilted, it would be so good to have my own machine, I'd sure save some money. Love the quilt, this would be a good quilt for a boy. Gosh - what a tale - but it all worked out in the end! I'm sure they will be delighted with the end result! Looks great - and triangles work well. Oh wow!!! You really had your problems with that one, but it is worth it now that it is finished! This is just one of the reasons I tend to stay with wall hangings and lap/baby quilts. Great quilt Marti. It's lovely to know other people take as long as I do to get those 'important' projects finished. Judd and Yvette are sure to love it and its certainly worth the wait.